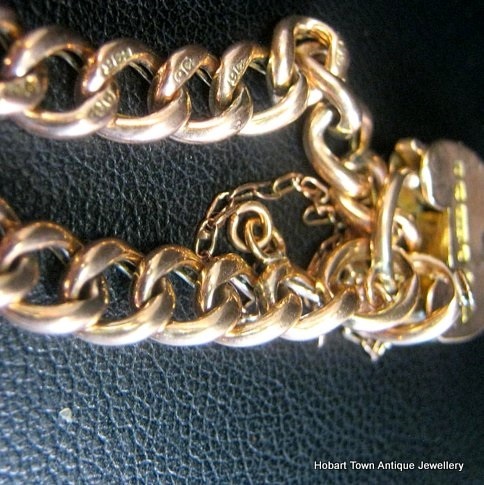 Fine Antique 9ct Gold Curb link Bracelet ~ Heart Shaped Padlock Clasp in excellent condition throughout. 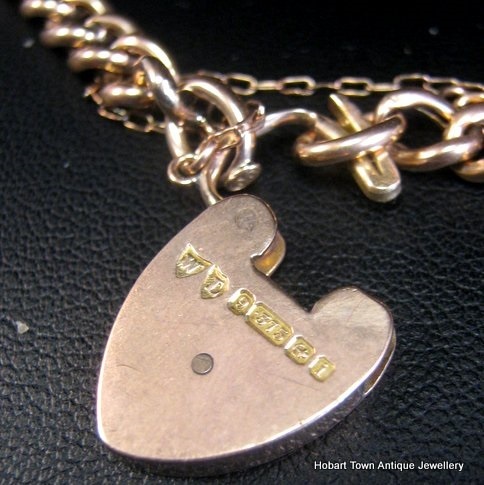 Almost all links hallmarked & fitted with a quality heart shaped 9ct gold padlock. 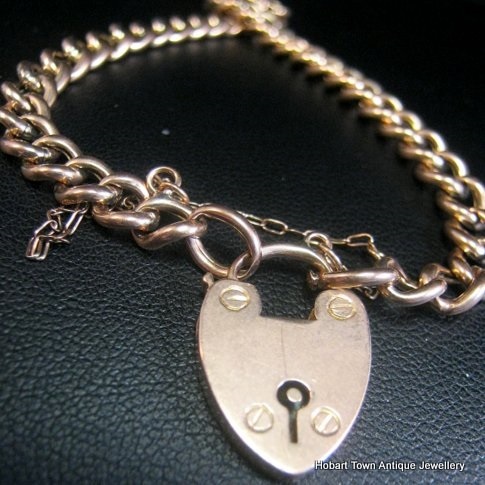 Fine Antique 9ct Gold Curb link Bracelet ~ Heart Shaped Padlock Clasp in excellent condition & ready for your wrist. No matter how they try , the modern / contemporary jewellers just can’t make theirs look like this classic Edwardian example does!! 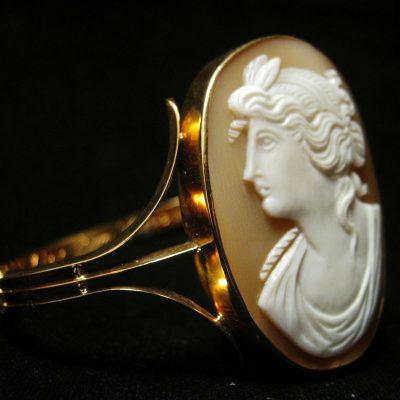 That indefinable antique aesthetic that most ladies love their necklaces & bracelets to have. 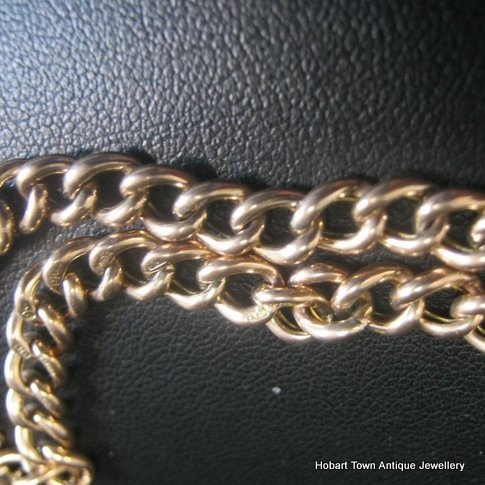 With almost all links being individually hallmarked as being 9ct gold , that fact alone would cost you $100 extra with modern ones just for the time involved with hallmarking each individual piece or link. 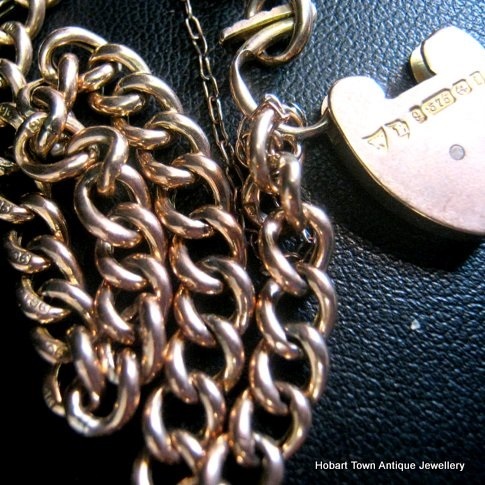 This very attractive & Fine Antique 9ct Gold Curb link Bracelet ~ Heart Shaped Padlock Clasp is all quality , and once again ….. has that very appealing antique patina that looks so good & is totally “unfakeable”. The heart shaped padlock clasp , the fine original safety chain is still retained , some 100+ years later & all in solid condition.Dating to the Edwardian period of 1908 ~ this handsome antique 9ct gold curb link bracelet has a beautiful glow to the gold & looks particularly beautiful on a ladies wrist! 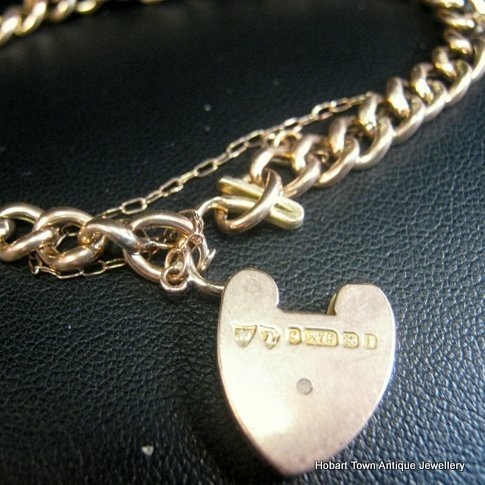 Guaranteed to look better when it is on your wrist than it does in these images ~ this Fine Antique 9ct Gold Curb link Bracelet ~ Heart Shaped Padlock Clasp is strong , secure , beautiful & genuinely very well priced!! 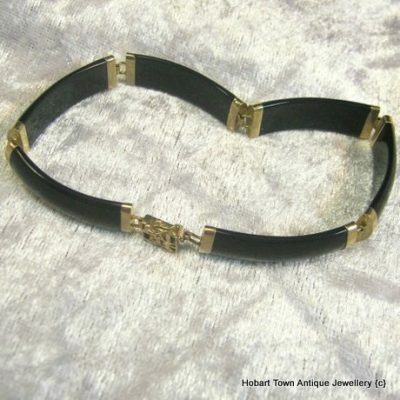 As we always do , we encourage you to take the time to compare this handsome bracelet to any equal quality antique bracelet with heart shaped padlock clasp that you may find on google in Sydney , Brisbane or Melbourne! We seriously doubt that you will even come close to this price , let alone better it! 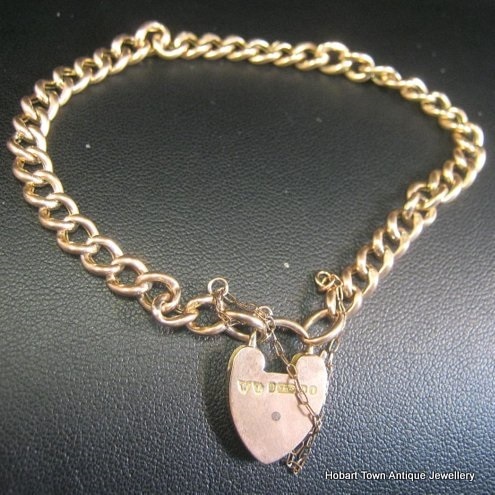 At approx; 7 x inches in length & 8.5 gms in weight , there are very few ladies that this handsome & Fine Antique 9ct Gold Curb link Bracelet ~ Heart Shaped Padlock Clasp would not be an ideal length/weight for. Dating to the last ten years of the 1800’s , this stylish antique piece has survived in superior condition to most seen & handled over the years & with condition of antique gold jewellery being a major consideration in determining both value & desirability. 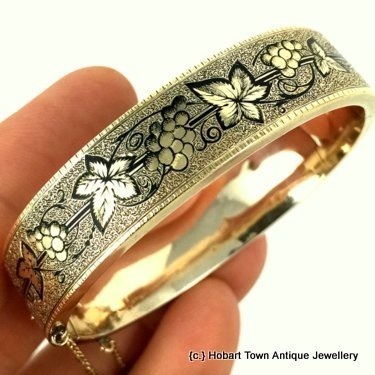 Once again Hobart Town Antique Jewellery has “delivered the goods” with this one! Priced to embarrass the Sydney , Melbourne & Brisbane shops & dealers ~ at just au$785 for this fine quality antique 9ct gold curb link bracelet with heart shaped padlock clasp & safety chain c1890 ~ I doubt whether this can be rejected due to being over priced , by anyone!! Fully hallmarked padlock clasp , showing it was made in Birmingham , of .375 gold / 9ct gold during 1908 with unknown makers marks ~ this 108 year old bracelet will outlast many more generations to come , as it has already done!